The original is 8"x10.5" overall. It is drawn on medium weight, hot press Crescent Illustration Board. German made Faber-Castell Drawing Pencils were used. The majority of the "pencil' was done with a #4 lead, while the remainder was darkened with a #6 and #8 leads. Total time to complete was 16 hours. 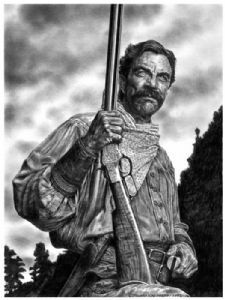 Description: This is a "pencil" of Tom Selleck in a 1996 movie, "Last Stand at Saber River."